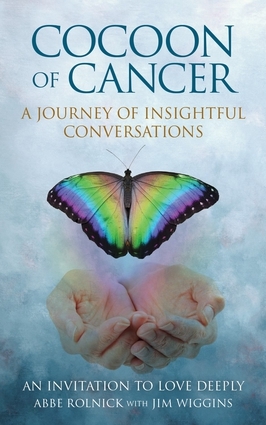 Love and intimacy inspire this book as well as inform those diagnosed with cancer, their caregivers, families, and staff. The essays and poems reflect an attitude of wonder, defiance, acceptance, and beauty through the painful journey. Sometimes raw, the letters to friends voice the unspeakable. The scientific tone of Jim, the patient, comes through when he has the energy to speak. His wife and caregiver, Abbe, witnesses and documents the signs of distress, gains, losses, and the new equilibrium that forges deep love. More than anything, this is an invitation to feel and find comfort. "Caregiver Tips", "Questions I Still Ponder", and "Questions for the Reader to Ponder" are included at the end of the manuscript. Abbe Rolnick grew up in the suburbs of Baltimore, Maryland. Her first major cultural jolt occurred at age 15 when her family moved to Miami Beach, Florida. To find perspective, she climbed the only non-palm tree at her condo-complex, and wrote what she observed. History came alive with her exposure to the Cuban culture. After attending Boston University, she lived in Puerto Rico, where she owned a bookstore. Jim Wiggins, MS, PWS, is a systems ecologist and President of a biological consulting corporation, Aqua-Terr Systems Inc. Always asking the questions "how and why" his yearly regional and international travels throughout his life, has provided answers to those questions, and creates new ones. They both live in Sedro Woolley, Washington.